Over the last 130 years, the indelible character of Sherlock Holmes has been portrayed more than any other; across plays, movies, radio programs, and in TV series, over 90 actors have donned the deerstalker. The Great Detective has been played by luminaries such as Academy Award-winner Christopher Plummer, the beloved Basil Rathbone, Christopher Lee, Charlton Heston, John Cleese, Leonard Nimoy, George C. Scott, Sir John Gielgud, Jonny Lee Miller, Robert Downey Jr., Benedict Cumberbatch, and so many more. The character of Sherlock Holmes has been interpreted in nearly as many different ways as there are actors who have played him. He has been cast as a purely cerebral and analytical machine, as an empathetic savior, and even as a patriotic soldier in the fight against Nazism. 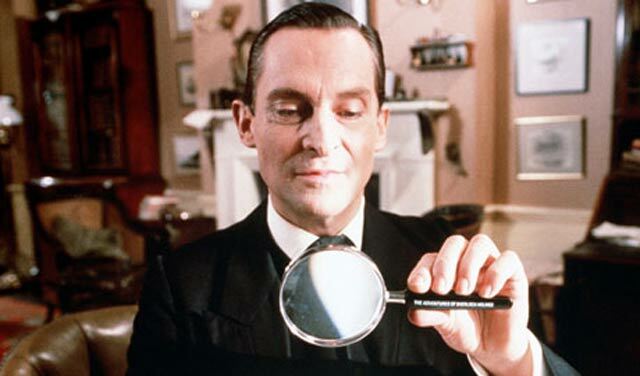 Two recent portrayals of Sherlock Holmes are especially well known by fans of the Baker Street sleuth: Jeremy Brett in The Adventures of Sherlock Holmes Granada series of the 1980s and 1990s, and Benedict Cumberbatch of BBC’s Sherlock. Both actors play Holmes close to Conan Doyle’s depiction: cool—even cold at times, determined to objectively analyse data no matter how counterintuitive the conclusion it might yield, prone to addiction, and moody yet devoted to friend and colleague Dr. Watson. Jeremy Brett had been acting for 30 years when he was cast as Holmes in the Granada series, famously appearing in My Fair Lady, War and Peace, Hamlet, and Macbeth among many other films, plays, and television appearances. Brett closely resembled Conan Doyle’s physical and emotional description of Holmes: elegant, urbane, and brilliant—of course—but not afraid to get his hands dirty when needed. Brett became utterly consumed with the character, reading everything he could find about Holmes and filling in the blanks with his own imagination. One might argue that his obsessive approach to playing Holmes paralleled the detective’s own approach to solving cases. After Brett’s wife Joan Wilson succumbed to cancer in 1985, his predisposition to mood swings became more pronounced. He suffered a mental breakdown and was diagnosed with bipolar disorder. Brett began taking medication to mitigate his symptoms, but was never quite the same—his energy level and physical appearance were both affected. Despite his health concerns, including the effects of heart disease originating from a childhood bout of rheumatic fever, Brett bravely continued playing Holmes until his untimely death in 1995. His uncannily spot-on portrayal of Holmes continues to generate new fans even today. As fans of Sherlock know, Benedict Cumberbatch has been playing Holmes for the last five years, through three television series, an upcoming Christmas special, and Series Four to air in 2016. His modern-day take on the iconic detective still incorporates the primary aspects of Conan Doyle’s character, with some modern-day updates: nicotine addiction has replaced cocaine, and the frequent use of technology is on par with what 21st-century fans would expect. 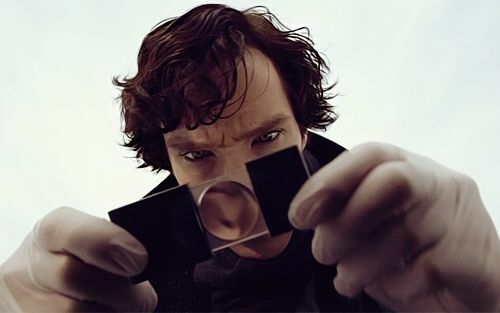 Yet even as Sherlock Holmes becomes familiar to more fans, the fundamental characteristics of the character remain rooted in Cumberbatch’s portrayal: cynicism tempered with affection for his friends, a fanatical devotion to finding the truth, a brilliantly analytical mind, and unflinching willingness to do whatever is needed to solve the case. Cumberbatch has mesmerized fans with his charismatic and hyper-verbal approach to the role, able to compellingly deliver pages of dialogue, sprint down the street after a suspect, dance at John’s wedding, and convey the intense mental gymnastics so closely associated with the role. Fans of Sherlock eagerly await the Christmas special and Series Four to see the newest adventures of Watson, Holmes, Lestrade, Molly and Mrs. Hudson. Happily, fans can now enjoy many of the various Holmes incarnations through streaming services, DVD, television, books, or the cinema. There is no shortage of actors who have played Holmes or ways to enjoy the character, which means that Sherlock will go on solving cases for years to come, to the delight of his legion of fans. 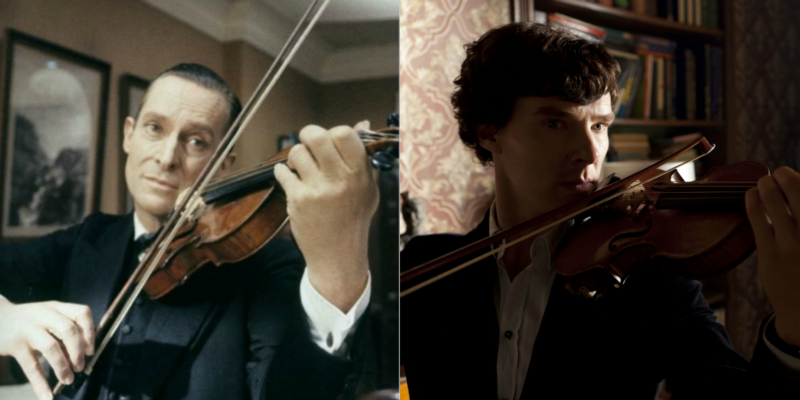 But which is your favorite Holmes: Jeremy Brett or Benedict Cumberbatch? I actually think Basil Rathbone was more accurate than Brett. Brett struck me as TOO cold. Holmes could be quite personable when he wanted to be, and I never got that from Brett. Rathbone, in my opinion absolutely nailed the character. Cumberbatch took him in a different direction entirely, emphasizing his differences with the rest of humanity by making him especially bad at normal human interaction, though managing to replicate it well enough when the need arose. I liked Brett, a lot, but he’s not my favorite. I cannot possibly choose, I love them both. Sorry to nitpick, but Doyle’s Holmes was a smoker, too. And in “His Last Vow”, we saw Cumberbatch’s Holmes also deals with an addiction to something stronger than tobacco. It’s not spelled out which one, although on Magnussen’s “file” it says it’s opium. I do disagree with the drug chosen to replace cocaine in the recent version. In the 1800’s, cocaine was not only legal, it was frequently prescribed as a nerve tonic. Doyle described Sherlock as needing the cocaine to calm his hyperactive mind when there wasn’t a case to work on. I think a more accurate modern version would have been to have him addicted to Adderall.